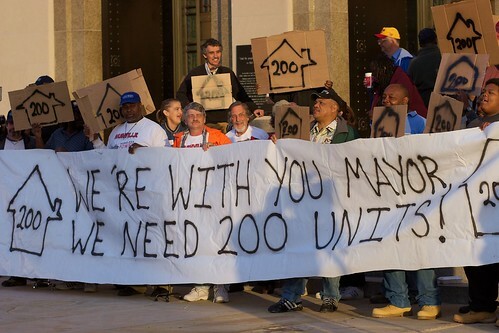 The NHPP gathered to rally on Friday morning before the Mayor announced a disappointing 50 housing units, for a total of $600,000 in his budget. The NHPP was hoping for and has been rallying for 200 units. Carmon Ryals says that 50 is not enough, but that they are “confident the mayor is going to find more in the capital budget”. More info at the Tennessean, and at the NHPP’s website. The NHPP has more detail on the budget, as well. I’ve got more pictures from the rally on Friday morning here. Guh. Come on, council folks. I am so sick of “Homeless Advocates”. If these “homeless advocates” think so highly of the winos and vagrants who are sleeping in our parks then why don’t they just offer some space in their own homes? These loudmouths are just using the invented issue of “homelessness” to advance their socialist agenda. There are plenty of places where people who need help can get help. Anybody who sleeps on the streets doesn’t want help and should be driven from our city to go bother somebody else. Good trolling effort. I give it a 3 out of 5, though. Too over the top. Next time, be a little more subtle. I’d be interested to see what the requirements are to obtain residency in those houses. I don’t think that just giving a house to everyone is going to solve problems. Housing projects result in high crime areas. $600,000 to build some cheap units is great. I wonder how much it’s going to cost after that in order to maintain, give power to, give water to, and police those units.